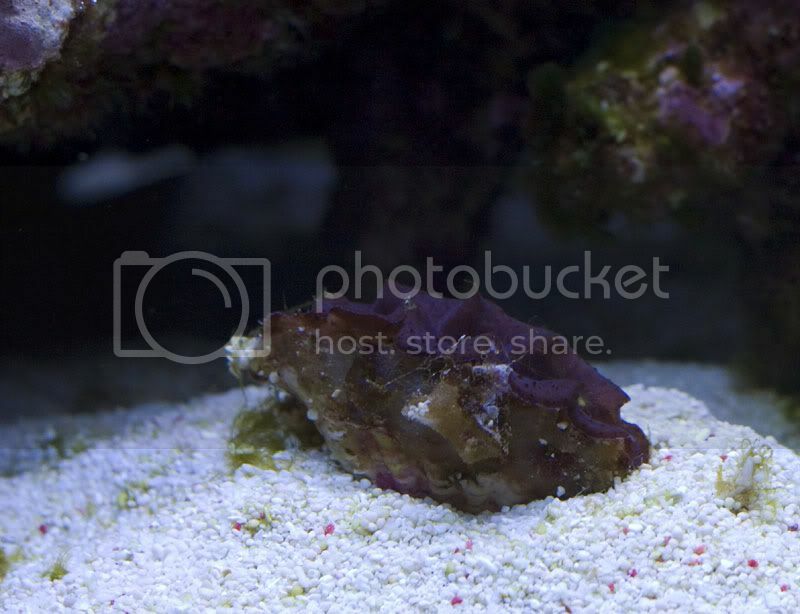 Edit: Lawnmower Blenny then two clowns, hrmm will a royal gramma be next! No Royal Gramma, Fire Gobys are next, then Flame Angel or Coral Beauty and finally a Six Line Wrasse. 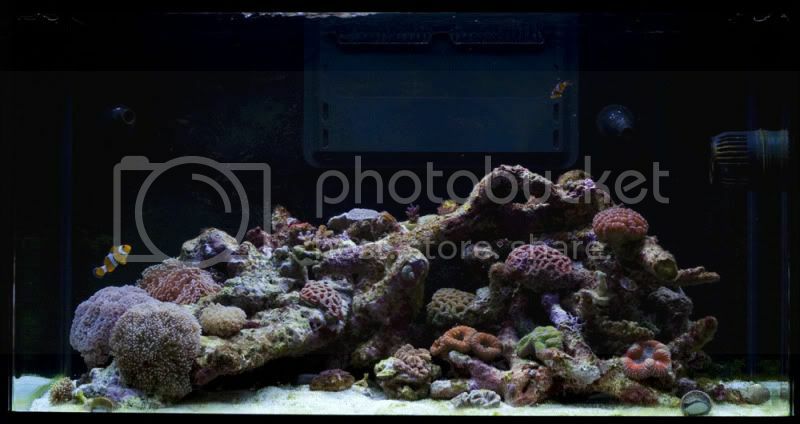 some great shots you've taken there so whats the anemone going to host?? sydneydrewid wrote: some great shots you've taken there so whats the anemone going to host?? We mooched on over to Tarren Point this morning to check out the Australian Coral Farms retail store. I must say it's a nice setup they have out there. We did come away with four new corals, a hammer coral, a stunning torch coral, a turbinaria and a collony of favites (pictured below). So far all other inhabitants look ok - we did a water change and cleaned out all traces of blended anenome from the filter/bubble trap sponges - a task I would be happy to never repeat. So we may have a slightly new livestock plan with the tank which means no wrasse and several shrimp! This is Pierre, our Redline Cleaner Shrimp and the latest addition to the tank. We plan on getting him a friend having read that they like to hang out in pairs. He is still a little shy at the moment, but he definitely knows what a syringe full of brine means! Last edited by GemmaS on Wed 07 Apr, 2010 10:09 pm, edited 1 time in total. Nice torch, noticed it when I was there and yep, it looks a whole lot better in the flesh! Paul_D wrote: Nice torch, noticed it when I was there and yep, it looks a whole lot better in the flesh! Redlines are so cool and always get great comments from non reefers. I just never mention how much I pay for them. ahhh are they open now?? I remember end of last year they were looking to move there. Where abouts in taren point? Unit 4 155 Tarren Point Rd. They share space with a dive shop. I have it sat on a peice of live rock under the sand - hoping it will attach so that we can move it up into some stronger lighting if required. Anyone know how I can ID this specimen? It seems as if the tank is showing no ill effects from the untimely death of the anemone. We have been doing a 10% water change every 2 days as a precaution. I got my hands on some epoxy putty and have attached two of the SPS frags, the blue/purple acropora right in the middle of the tank and the purple montipora with green polyps over by the Vortech. GemmaS wrote: This is Pierre, our Redline Cleaner Shrimp and the latest addition to the tank. We plan on getting him a friend having read that they like to hang out in pairs. He is still a little shy at the moment, but he definitely knows what a syringe full of brine means! I hteenk dut dis ezz, Lucky ... Lucky Pierre, de dazleeng shreeemp! Great pics and lovely display. "These are my Principles... if you don't like them, I have others." Groucho Marx. wow, the tank looks very nice.. love the colour! !